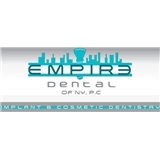 EMPIRE DENTAL NY PC (Brooklyn) - Book Appointment Online! Dr. Anatoly Bartov is a perfectionist. His practice philosophies are 100% patient satisfactory. He has graduated from the Top Dental School in the Country, Tufts University School of Dental Medicine. He is a high-end Cosmetic Dentist with Surgical Implantology training from Kings County Hospital and NYU School of Dentistry. The practice is equipped with the latest dental equipment, and his staff is welcoming and highly trained. Very friendly and professional. Definitely will book future appointments here!